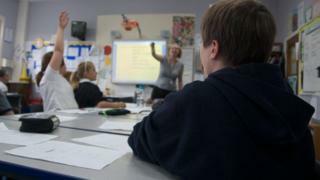 The number of teachers working in Scottish schools has gone up, according to official figures. Just over 51,500 teachers were at work in primary, secondary and special schools across Scotland on the date of this year's survey. This was a rise of 540 on last year's teacher numbers. The increase came despite concern raised by parents about unfilled teacher vacancies in some areas around Scotland. The number of primary and secondary teachers rose but there was a drop in the number of special teachers. The average pupil-teacher ratio fell slightly from 13.7 to 13.6 pupils. The information is contained in the government's annual document containing statistics about schools in Scotland. The data revealed that the average size of P1, P2 and P3 classes fell between 2016 and 17 - but these classes were still larger than they were in 2011. The average P1 class in 2017 had 21 pupils compared to 20.5 in 2011. The average P3 class in 2017 had 24.7 pupils against 23.9 in 2011. Legislation introduced in 2010 means that primary 1 classes cannot normally have more than 25 pupils. However once P2 and P3 pupils are included, the number of infants in a class of 26 or more rose from 36,700 in 2011 to 44,300 in 2017. Separate data also highlighted what proportion of pupils were performing at the expected level for their age in reading, writing, listening, talking and numeracy. The information is based on the professional judgements of teachers and is not directly comparable to data given in previous years. Data is issued covering P1, P4, P7 and S3. For example, in reading, 80% of P1 pupils achieved the expected level. This slipped to 76% by P7. These figures also highlighted the gap between how well children from relatively rich and poor backgrounds perform. The gap between pupils from the 20% most deprived areas and those from the 20% least deprived areas for writing at P7 was 22 percentage points. The figures also revealed that the bulk of the extra teachers were being paid for out of government money being given straight to head teachers to help close the gap between how well children from relatively rich and poor backgrounds perform. This cash has paid for 506 of the 543 additional teachers across Scotland rather than core local authority education budgets. Deputy First Minister John Swinney said: "Education is this government's number one priority and we are investing heavily to ensure every child in Scotland has an equal chance to realise their full potential. "This investment is improving education: we have more teachers in Scottish classrooms, better quality school buildings and the vast majority of children in S3 achieving the minimum attainment level expected of them or better. "And, we can now see that our decision to give head teachers more money and more power to decide for themselves how to close the attainment gap is paying off." He added: "Hundreds of additional teachers are now in Scottish classrooms, benefiting pupils the length and breadth of Scotland, as a result of that decision. "That's good news for teachers, parents and pupils. I recognise the scale of the challenge involved in closing the poverty-related attainment gap. "That is why we are doubling free early learning and childcare to give every child the best start in life and reforming education, backed by £750 million over the course of this Parliament through the Attainment Scotland Fund." Kenneth Muir, chief executive of the General Teaching Council for Scotland, welcomed the news: "We are pleased to see this evidence of the successful work GTCS has done throughout 2017 to register teachers from Scotland and the rest of the world in preparation for taking up jobs in Scottish schools. "Over the last three years we have seen consistent increases in the number of teachers registering from outside of Scotland. "While maintaining and upholding our standards for registration, we have made strenuous efforts to offer more flexible, online processes for potential registrants in order to support the collective effort to raise teacher numbers. "It is clear that we have played a key role in this successful, and continuing, work." Scotland's largest teaching union, the Educational Institute of Scotland (EIS), said the increase was largely based on Attainment Challenge funds, which are intended to be additional resources. The union thinks the situation could be solved by improving levels of teacher pay. General secretary Larry Flanagan said: "Young people in our classrooms should have the right to expect a high-quality educational experience, delivered by sufficient numbers of fully qualified teachers. "The agreement to maintain teacher numbers across Scotland was hard won and is designed to keep class sizes at an acceptable level, facilitate a quality learning environment for pupils, and provide job opportunities for graduate teachers entering the profession. "The EIS welcomes the fact that there has been a reported overall rise in the number of teachers employed in Scotland - although we are disappointed to see yet another drop in the number of teachers working in early years and have concerns over the sustainability of posts funded through Attainment Challenge money." The union wants salaries brought in line with other graduate professions and with teachers' salaries in other countries.